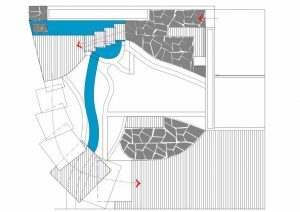 Some clients experience difficulty in understanding 2D plans, even when provided with additional elevation and section views of the design. 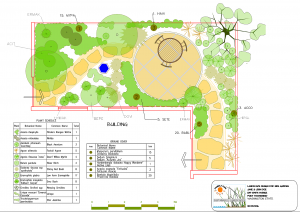 It is of course, possible to hand sketch a 3D view of a design and incorporate that in a set of gCADPlus plans, but not everyone has the necessary skills to do that quickly and easily. 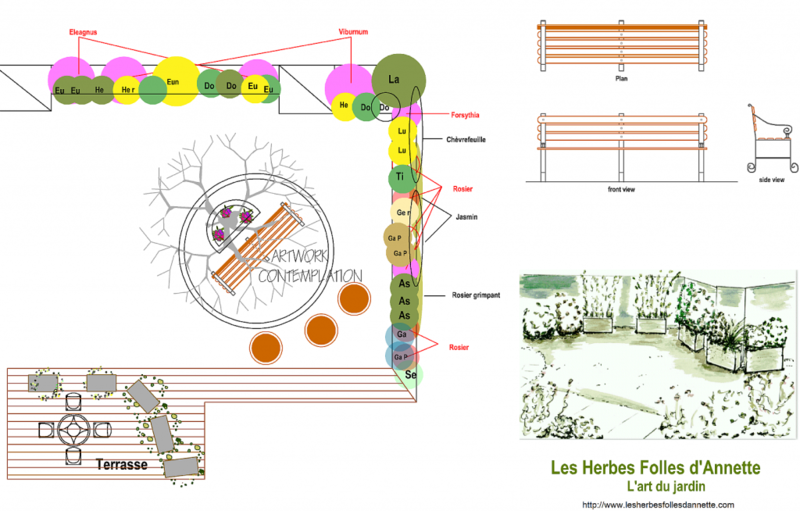 The figure below shows that technique to be very efficient – a quick hand sketch is used to illustrate the arrangement of planter boxes on a terrace in a gCADPlus design. Rather than hand sketch, a time consuming task, many drafters now export gCADPlus geometry to other software applications and build a computer generated 3D representation of the design. 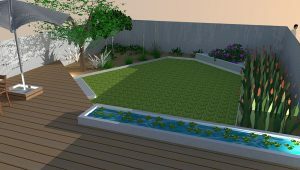 Here are some examples of 3D landscape models generated in SketchUp from 2D designs created using gCADPlus. 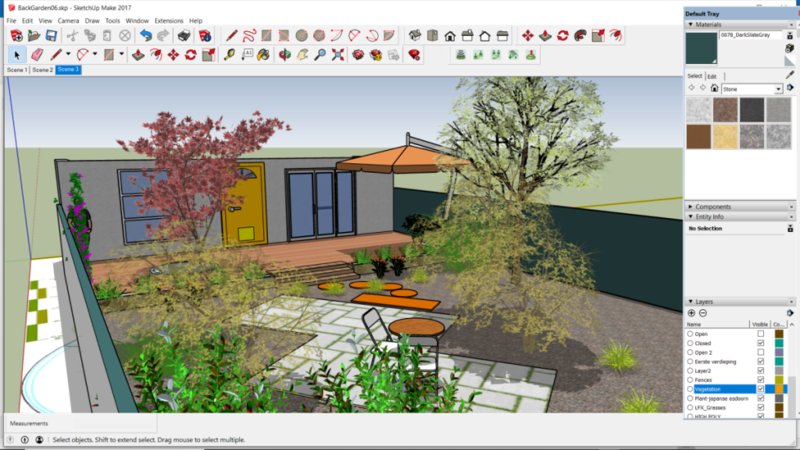 Tip: SketchUp is a tool previously owned by Google and free to use, is now owned by Trimble but now comes at a cost – a relatively expensive $USD 695. It is possible to get information from gCADPlus to SketchUp easily because gCADPlus provides a number ways of exporting base information. 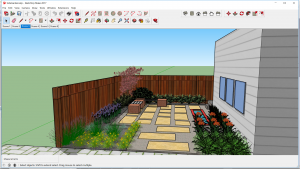 Building a 3D model in SketchUp is then greatly simplified because the accurate 2D information from gCADPlus serves as a base for the 3D model. Use a SketchUp Pro which has the ability to import DXF (and DWG) files. 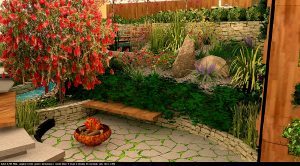 Take a gCADPlus drawing for an area near the side of a house or a rear garden as shown below and export a graphic into SketchUp. This movie shows how to export a graphic from gCADPlus and use it in SketchUp as a base for building a 3D model. The images below show examples of the use of this approach. It is possible to assign a Z value to entities (structural elements) in the gCADPlus drawing environment. Use the “Create SketchUp Layers” tool and export accurate 2D information from gCADPlus in the form of a DXF file. Entity snap in SketchUp based on the transferred information is then possible. Export geometry from gCADPlus as a DXF file, import it to SketchUp and begin building the model. This movie shows how to pass elevation data to SketchUp. 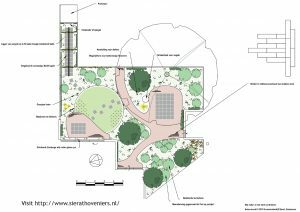 Use the layer stack tool and isolate just those entities that you want to work with as a base in the SketchUp environment (turn off unwanted layers, including the layer on which plant symbols have been placed). Select the Make SketchUp layers tool from the gCADPlus drop down menu. Assign a Z coordinate to entities if required. In the example above, the yellow deck was set at 300, the grey paved area 100 and the white decoration 105. Select entities (no hatching, no plant symbols, explode blocks if used to make structural details). Choose whether or not to transfer symbols and text to another layer. Start SketchUp and import the DXF file that’s been exported from gCADPlus. If you have assigned elevation values to each structural entity, it is a simple task to use the Push/Pull tool to create 3D geometry. 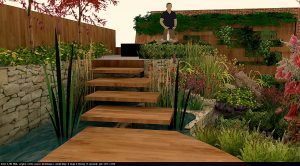 Use your SketchUp skills to assign materials to surfaces. 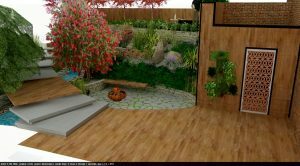 Add planting and furniture. 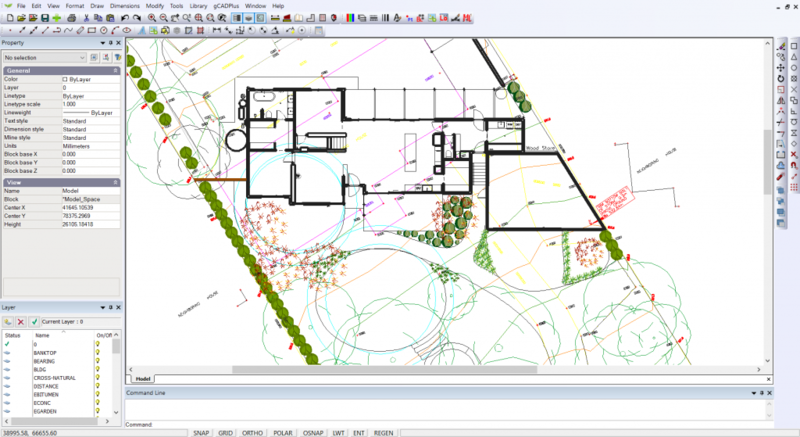 An image file taken from the elevation view in gCADPlus was pasted onto the screen. If required, the model can be passed to rendering software for higher resolution and softening. Note the loss of detail of graphic on the screen wall. This is a function of the renderer in use. It is possible to include the graphic on the rear wall in some ray tracing software. 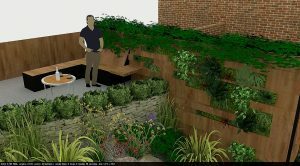 Some clients may benefit from seeing an animation of the proposed design. The polylines indicating the building footprint maintained a heavy thickness even though they were set correctly in the gCADPlus properties box. Unfortunately, the DXF file from this particular drawing could not be read by gCADPlus. SketchUp reported a group code problem. Here is a link to a small movie showing how we overcame the problem.